Small cats like catching mice too for which they need a balanced diet. Especially while still growing, an optimal diet is very important for the development of your cat. 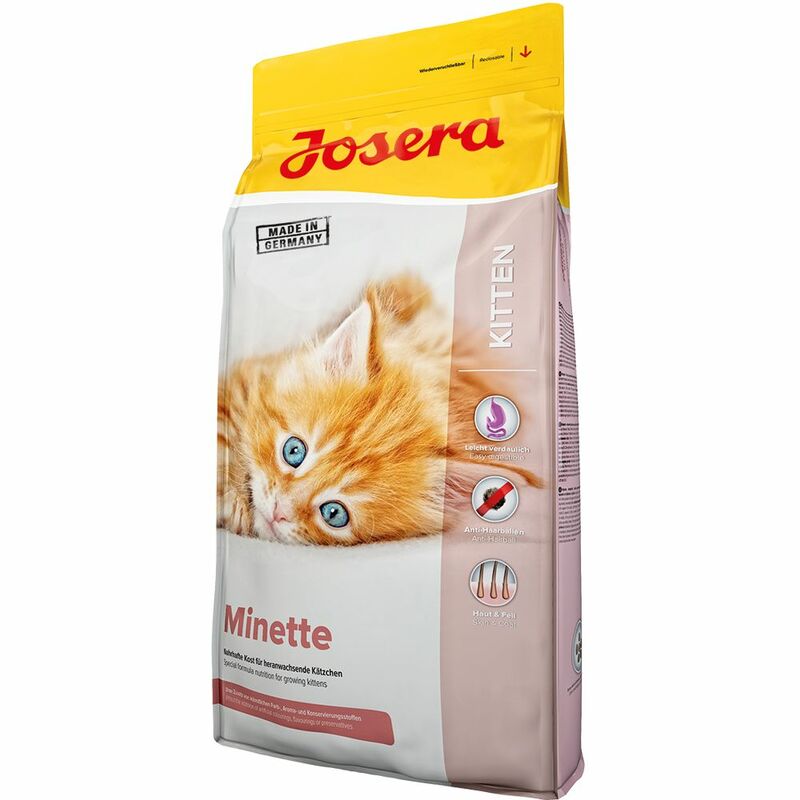 Josera Emotion Minette is a delicious cat food rich in energy and easy to digest for growing, pregnant, or nursing cats. Taurine helps ensure a healthy metabolism while improving sight and strengthening the heart. The rich amount of eΒential vitamins, minerals, and trace elements support the healthy development of your cat. Your kitty will love the fine, easy to chew, kibble. It will improve his/her dental hygiene and limit the build-up of tartar. Josera Emotion Minette Cat Food is optimally tuned to your cats needs. The resealable bag guarantees your cat's food will stay fresh. Safe for Digestion: Josera Minette is carefully produced cat food. The high quality, premium ingredients ensure optimal digestion. Also suitable for sensitive cats. Anti-Hair Ball: Your cat spends a large part of its day grooming itself. He/She will often swallow single hairs that can eventually collect into nasty hair balls. Special dietary fibe in Josera Emotion MinetteCat Food allows this hair to progreΒ further through your cats digestive tract in order to prevent the formation of hair balls. Skin and Coat: a shiny and shimmering coat as well as healthy skin are both signs of proper care of your cat. Omega 3/6 fatty acids, Vitamin E, Biotin, and Zinc (all organic) help to maintain your cats lovely appearance Vitality: the addition of high grade protein aΒures easy digestion resulting in reduced amounts of vomit. High quality amino acids that catalyze the active ingredients yeast and vitamin E help strengthen the immune system. Josera is known for its controlled and tested top quality from the Odenwald. Josera cat food has been developed using environmentally friendly techniques and the latest scientific findings with the collaboration of experts and practitioners. Each Josera Emotion product is ideally suited to the individual needs of its targeted type of cat. Price just £32.99! Click here to buy now!